"I, Hercule Poirot, have eyes which notice everything." Hercule Poirot (Peter Ustinov)—Agatha Christie's master detective—spends his time in the background and observes suspicious conversations and mannerisms. Unnoticed by most parties, Poirot gathers information and pieces together complicated puzzles of crime and murder. On a cruise down the Nile, his amazing abilities allow him to discover the actual reasons for the intricate murder of a wealthy heiress. 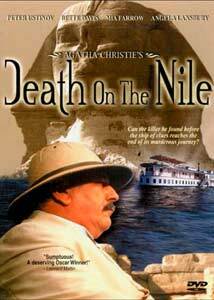 Typical of Agatha Christie novels, Death on the Nile makes nearly everyone a suspect and provides them with an understandable motive to commit murder. Mrs. Linnet Doyle (Lois Chiles) is a beautiful woman who enjoys the fruits of abundant wealth. In the process, she has developed numerous enemies on a personal and professional level. Who would possess the will to murder Mrs. Doyle? Could it be Jaqueline De Bellefort (Mia Farrow), the spurned lover of Linnet's husband? How about the haughty Mrs. Van Schyler (Bette Davis), a woman obsessed with her expensive pearls? Obviously, nothing occurs in a simple manner, and Poirot must sort through the mess to uncover the startling truth. The exotic and magnificent landscape of the Nile River provides the perfect location for murder and intrigue. Placed in a simpler setting, this story would be a run-of-the-mill thriller with a few nice plot twists. Instead, the grandeur of the area contrasts intriguingly with the dark nature of the inhabitants of the cruise. The awe-inspiring historic monuments create added suspense, especially in one impressive murder attempt. Unfortunately, this scenery also slows the film and hampers the flow of the story. During several dull interludes, especially early in the movie, the action nearly stops to accommodate the locations visited. This extends the running time to nearly 140 minutes, which is too much for this mystery. In his first role as Hercule Poirot, Peter Ustinov adds subtle elements of humor and enjoyment to this brilliant character. He must constantly remind people that he's Belgian, not French, and his mannerisms work perfectly. With a hulking presence and a unique mustache, he spends his time feigning sleep and relaxation, but in actuality he is studying the roots of murder. Ustinov gives Poirot an accessible nature that keeps him interesting without making him a caricature. When he stands in front of the group in the end and reveals the truth, his logic is astounding but completely understandable. Similar to its predecessor, Murder on the Orient Express, Death on the Nile succeeds based on the efforts of a talented cast of supporting characters. Angela Lansbury (Murder, She Wrote) is surprisingly over-the-top as romance novelist Salome Otterbourne, an eccentric woman who may not have all her wits. Mia Farrow sheds her usual shy demeanor with her energetic portrayal of spurned lover Jackie. Lois Chiles (Moonraker) is understandably vile and stunning as the target of everyone's anger. All of the actors give strong performances, and this raises the story above the typical mystery film. Death of the Nile succeeds through its creative plot and the efforts of an impressive cast, but it lacks the extra punch necessary for classic cinema. The first hour is slow moving and spends too much time building up to Poirot's compelling investigation. While some of the character development is obviously needed, this lengthy period creates a muddling pace that lessens the effect of the later events. Also, there are limits to this whodunit genre, as red herrings must constantly appear to keep the audience guessing. This helps in heightening the mystery, but it often keeps us alienated from the main characters. Image Transfer Review: The 1.85:1 widescreen anamorphic transfer on this disc presents the exotic locales of Egypt in a bright and colorful manner. The blue skies look wonderful, and the dark waters of the Nile are impressive. The print does contain a significant level of grain, but that is understandable considering the age of the film. Also, specks of dirt did appear intermittently on the print. However, this transfer works nicely and presents a clear picture of the beautiful scenery along the Nile. Audio Transfer Review: This 2.0-channel mono transfer emanates clearly from the front speakers, but it suffers from the limitations of its sound format. No real depth exists in this transfer, and it lessens the effect of several suspenseful scenes. The music is fairly light and lacks the power necessary to create tension. However, the sounds are clear and Poirot's extensive dialogue comes through nicely. One effect that works impressively is the blowing winds at the Temple of Abu Simbel. Overall, this audio transfer works adequately to convey the events of the film, but it fails to add any force to the story. Extras Review: Death on the Nile contains an impressive amount of extras, but these features are fairly light on compelling content. The highlight is a 24-minute behind-the-scenes documentary that covers varied aspects of the making of the film. Much of the material here comes from interviews with stars such as Peter Ustinov and David Niven. The information presented is mildly interesting, but it merely covers the surface of the story. Also, too much of the running time is spent showing brief scenes from the movie. This documentary does provide a nice look at the replica of the cruise ship created at Pinewood Studios. This disc also includes brief interviews with Peter Ustinov and Jane Birken. The eight-minute conversation with Ustinov occurs in Spanish, but is available with subtitles. He appears to be a genuine person who lacks the egotistical nature of some actors. One silly moment has Ustinov demonstrating his unique vocal abilities. The interview with Birken is difficult to follow because it mixes English questions by the reporter with a Spanish translation. She's a friendly woman, but this four-minute conversation mostly contains fluff. The Talent Bios section lists the actors by their character name under the heading of "Suspects, Victims, and Innocent Bystanders." The Peter Ustinov biography is very extensive, and covers his lengthy film career. Smaller biographies and film lists exist for the other major actors in the story. Finally, we have the theatrical trailer, which exists in a grainy widescreen transfer. It is well done and makes the story appear interesting without revealing the entire plot. Death on the Nile features a complex and exciting mystery, a wonderful cast of characters, and a picturesque exotic location. This Agatha Christie story will keep you guessing until the final revelation, and it provides for entertaining cinema. While the story takes a while to begin and drags painfully a few times, it stands as an interesting whodunit mystery.